Marcus Boots - Bearpaw's men boots are some of the best on the market for a myriad of reasons. First and foremost, the Marcus Boots are made out of cow suede leather, wool and sheepskin inserts, and durable yet flexible rubber outsoles. They're quality from heel to toe and are built to last the duration. This particular boot features a 5.5 inch twin gore upper and are a pull-on style boot without laces. The benefit here is that you get a snugger fit with a boot that's easier to take on and off. While not great for work boots, the NeverWet technology repels water and keeps your foot dry and clean. Bearpaw's motto is ""Live life comfortably."" Beginning in 2001, Tom Romeo founded the Bearpaw brand with the idea of redefining casual shoes with sheepskin, nature´s own technical fabric. Since sheepskin naturally regulates body temperature, feet stay cooler and drier in the heat and warmer in the cold. NeverWet Technology - This is a treatment Bearpaw gives it boots so that you get them when they're 100% waterproof and able to stand up to everything Mother Nature can throw at them. 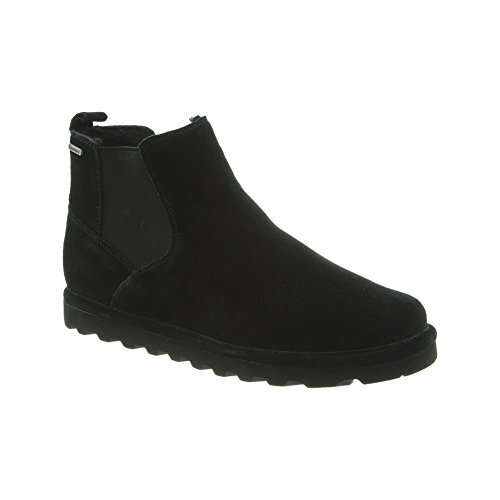 Pull-On Style - Unlike slip-ons, a pull-on style gives you a lot more stability and security in your boots. The elastic used in the upper is a lot stronger than your typical laces, and thus the foot receives much more support, and it's easier overall to get on and and off. Sheepskin and Wool Lining - You cannot get more comfortable than sheepskin for a footbed, and Bearpaw even upped the ante on comfort by also using wool in the lining to provide you with more warmth. Combined, this makes for a very cozy and comfortable boot to wear. Cow Suede - The pinnacle of suede leather, Bearpaw held nothing back in creating long and elegant boots out of the best cow suede on the market. This adds strength, durability, and that supple, healthy shine that men love in their boots. Rubber Outsole - While a rubber outsole is typical, Bearpaw went above and beyond by creating a high-traction outsole that can hold up to the elements, while still being able to flex and bend with the foot for a comfortable experience.